The ProQuest platform allows institutions to customize their interface with their institutional logos and links, and our latest release increases the visibility of these branding elements. Here's an update on the changes. Up until now, logos and links have been displayed in the footer across the platform, where they can be easily missed by researchers. Branding elements now are given more prominence and added to new pages. Note: Site administrators may want to swap the order of their logos or links, which they can do quite easily in the ProQuest Administrator Module. It’s possible that some primary branding will need to be resized/revised if it doesn’t display well in the space available, especially if the logo is in a portrait orientation or circular. In the ProQuest Administrator Module (PAM), wording on the Branding page will change so that instead of labels such as Link 1, Link 2, Logo 1 or Logo 2, we will use Primary Link and Primary Logo, Secondary Link and Secondary Logo to reflect the new emphasis. 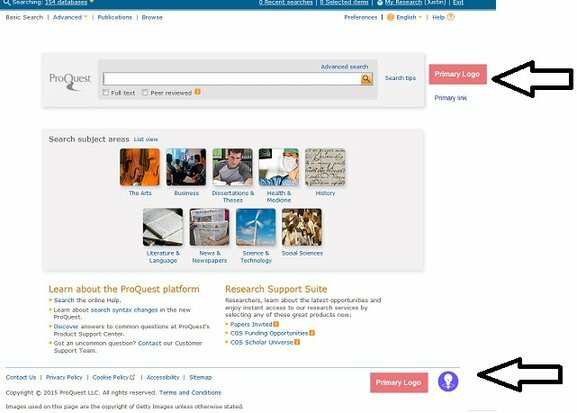 Contact ProQuest Customer Support with feedback, questions, or concerns.